I'll give it a go probably tomorrow. With the maintenance release of HNSKY of 2018-3-23, rotation of the frame with small steps is possible by Alt+Mouse Wheel. No solution yet for a laptop without a mouse wheel. >>Maintenance update. Added small step zoom by Shift+Mouse wheel and small steps rotation by Alt+Mouse wheel. Yes the 5 degrees step should be smaller. Maybe I allow setting the position manually it in the settings menu. Note that the mosaic is not saved automatcally. For this save supplement 2 manually. I guess I was just being lazy! By getting ASTAP to (optionally) increment the name it would just save me closely monitoring the folder. I'm slowly getting my head round the Mosaic process - so thanks for the extra tips. I'll have to think about the HNSKY to APT communication option. My original plan was to use CdC as my primary skychart (sorry! - I've just got used to it), connected to both APT and the mount. I was then going to use HNSKY for it's functionality, but only connected to the mount. Anyway, I'll pass your suggestion on to Ivo via the post I linked above; unless you have already discussed it with him? Unfortunately my Laptop's mousepad doesn't have a "Wheel" function, so to use the "rotate" function I had to attach a mouse. Might it be worth implementing a shortcut key option? [UPDATE!] I've discovered my mousepad DOES have "Wheel/Scroll" functionality! I thought it must have so went searching. It turns out I just needed to use two fingers to activate scrolling. Although, weirdly, the two fingered scroll/up down gesture zooms in and out, whilst the finger thumb expand/contract gesture rotates the measuring frame. When rotating the frame, each click of the mouse wheel turned the frame a fixed amount. This meant I couldn't exactly align the frame to the imported .fits image. It was only a few degrees out, so not a big issue, but it might make aligning a large mosaic a bit awkward. [*]When rotating the frame, each click of the mouse wheel turned the frame a fixed amount. This meant I couldn't exactly align the frame to the imported .fits image. It was only a few degrees out, so not a big issue, but it might make aligning a large mosaic a bit awkward. As Ruedi indicated, rename the file or select it with the mouse and just hit CNTRL-C CNTRL-V to copy it to an other name. All FITS files in the directy will be plotted. Please remember that you can control the FITS dimensions size by the saved window size of ASTAP. All ASTAP settings are saved as soon you leave the program. Smaller window size smaller file size and faster response by HNSKY but less details. For a mosaic, the best approach I think is to design it using the mosaic design tool in HNSKY and send the positions to APT via the server link using right mouse button. In the help file it is very briefly described. Just switch the measuring frame on (right mouse button) and hit the HOME key to draw rectangles on the map. The center positions are indicated at the corner of each reactangle. If you place the measuring frame over the reactangle, you can send the position to APT using the right mouse button menu again or you can enter them manually in APT. The size of the measuring frame can be set in menu SETTINGS (CNTRL-E) tab SETTINGS. You can als rotate them to any angle with the mouse wheel while holding the CTRL key down. Normally the are just simple orientated to north/south. The only think I haven't worked out so far is how to move the scope to the next mosaic location - other than to place the mouse in the centre of the rectangle and select "Right Mouse button > Telescope > Slew to Mouse position". Is there a better way? Now, each new solve overwrites the file "ImageToSolve.fits". I always rename the file with something more meaningful. HNSKY will load all .fit files in this folder. I saw your post in the APT Forum about using ASTAP to write a PlateSolve solution into a .fit file (http://aptforum.com/phpbb/viewtopic.php ... ead#unread). I followed your instructions and it worked perfectly. This got me looking at HNSKY. Again, with a bit of research I worked out how to show the .tif image in HNSKY and then create a Mosaic Plan around it. So far so good! 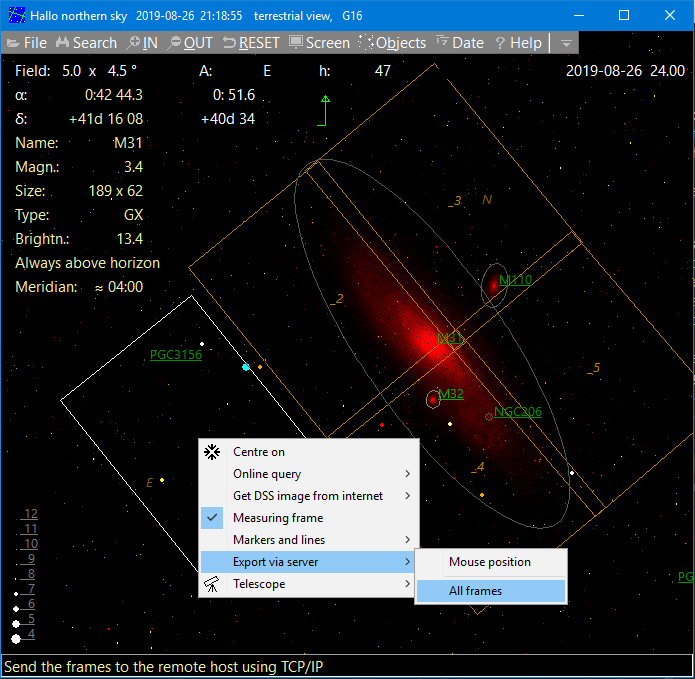 The only think I haven't worked out so far is how to move the scope to the next mosaic location - other than to place the mouse in the centre of the rectangle and select "Right Mouse button > Telescope > Slew to Mouse position". Is there a better way? Currently, as I understand it, each time APT makes a call to ASTAP (renamed PlateSolve2.exe), after a successful solve, ASTAP will create a file called "...TemporaryStorage\ImageToSolve.fits", which can then be read into and displayed in HNSKY. This is certainly what I see. I think, but am not certain, if this is then read into HNSKY the previous .fits image disappears, because that contents no longer exists. Even if it doesn't, then if for some reason HNSKY has to be restarted only the latest .fits image can be imported. It also means there is no list of files that can be selected in ASTAP to create a mosaic. What would be great would be an option to increment a count in the filename "...TemporaryStorage\ImageToSolve.fits". So, for example if the file already exists, then "ImageToSolve-1.fits" is created, then "ImageToSolve-2.fits", etc. This would allow all completed parts of a mosaic to be displayed in HNSKY. It woud also, I think, allow ASTAP to be used to stack the images. This got me looking at HNSKY. Again, with a bit of research I worked out how to show the .tif image in HNSKY and then create a Mosaic Plan around it. :geek: So far so good! The only think I haven't worked out so far is how to move the scope to the next mosaic location - other than to place the mouse in the centre of the rectangle and select "Right Mouse button > Telescope > Slew to Mouse position". Is there a better way?